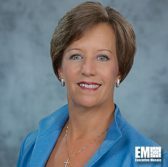 Rebecca Cowen-Hirsch, senior vice president for government strategy and policy at Inmarsat Government, told the Fairfax County Economic Development Authority in a video interview posted Friday how the company supports government operations through its satellite communications platforms. She said satellites placed approximately 35K kilometers above the equator and ground stations that back those spacecraft work to provide users with voice, data and video capabilities to support airborne, land and maritime operations. “Those kinds of uses could be everything from what you’re hearing about the internet of things all the way through to video transmission on aircraft,” she added. Cowen-Hirsch noted that the company continues to invest in tech capabilities in support of higher data or higher throughput demands. “Our users expect satellites to provide that additional enhanced capability,” she said. She highlighted how the educational system, technologies and other opportunities in Fairfax County, Va., help the company maintain and build up its workforce. She also mentioned the company’s efforts to support government users through the Global Xpress Ka-band network and satcom-as-a-service capability.